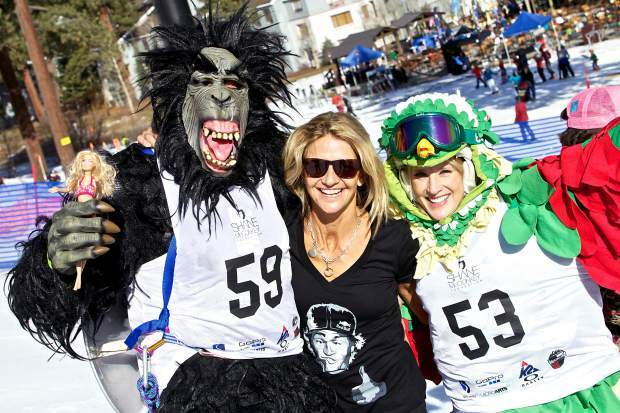 Sherry McConkey, center, joins in the fun at last year's Pain McShlonkey Clasic at Squaw Valley. An annual tradition, one that pays homage to the life and legacy of a skiing giant, returns to Squaw Valley this weekend. The eighth Pain McShlonkey Classic runs Friday evening through Saturday. The event is organized by the Shane McConkey Foundation, a nonprofit created to honor the legacy of ski legend Shane McConkey. Among other notable claims, McConkey is credited for coining the term “freeskiing” and helping popularize fat skis. McConkey died in 2009 at the age of 39. The foundation aims to continue his legacy “through random acts of kindness and charitable giving and to inspire others to make a difference in the world at large,” according to its website. The celebration starts Friday with an aprés party at Plaza Bar at Squaw Valley. The festivities really get underway Saturday starting with the Hot Dog Downhill from 9-9:30 a.m.
“Watch some of the world’s greatest winter athletes dress up in ridiculous outfits and compete for the coveted Pain McShlonkey Golden Saucer trophy in the ultimate snowblade showdown,” states the event description. A costume contest follows at Squaw’s KT Base Bar Sun Deck from noon to 1 p.m. The contest is open to everyone. A raffle giveaway filled with gear, gift certificates, GoPros and more will run from 2-2:20 p.m.
Head to shanemcconkey.org for information about the foundation and the weekend’s festivities.